Answers to most asked questions about our therapeutic products and services. We pride ourselves on the quality of our products. If you are not satisfied with your purchase you may return your item(s) within 60 days from the purchase date for a refund. All items must be in like-new, resalable condition and in original packaging. Special orders like two left or right hand glove cannot be returned but we accept exchange. We ship our Infrared Therapy products all over the world, to many countries. If your country is on the list in the drop down menu of the shopping cart, then we ship there. As items are placed in the cart, and the destination address is entered, you will be shown your choices of shipping options and their respective costs, before finalizing the order. Please visit our Shipping page for further details. My product doesn't fit, what now?! We are happy to exchange your product if the size is not correct. Please contact us to let us know you need a size exchange and we will find the right size for you. Is it safe to wash Infrared therapy products? Absolutely! Hand washed them in warm water with mild soap and air dry on a flat surface. Do not put in drying machine. Do not dry clean. Do not iron or bleach. 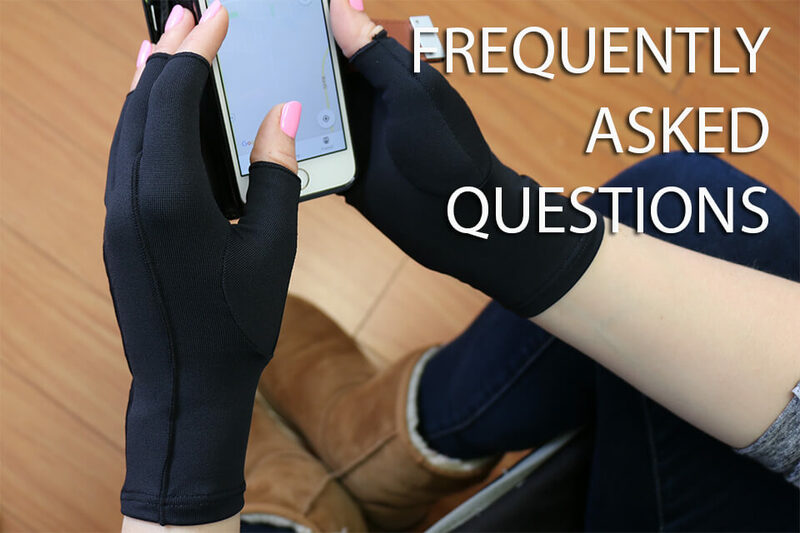 Can I order a pair of gloves for the same hand? Yes! We now allow our customers to order a pair of gloves for the same hand. Example, instead of receiving one glove for each hand, you can ask for two gloves for the same hand. There is no extra charge. All you need to do is request for which hand you wish to receive the gloves for in the ‘Customer Ordering Note’ field during checkout. How long do Infrared therapy products last? The far infrared reflection capabilities gradually fade over time. After a year, depending on how often the product was worn and washed, the reflection capabilities are reduced. The average useful lifespan of the Bio Ceramic fabric is 14 months. Follow the suggested washing instructions and the therapy products should last a long time. Keep in mind that Veturo Therapy products are designed for therapeutic use only. Using them while working intensely with your hands, such as gardening for example, will cause wear and tear of the products. Are there any side effects from wearing infrared therapy products? There are no known side effects from wearing therapeutic clothing items made with Bio Ceramic fabric. In some cases, people may experience a detoxification effect in which they feel too warm or experience too much energy. This is a sign that the far infrared therapy is working very well with the persons body. If you have doubts about the use of far infrared therapy products, please consult your physician for medical advice. Can I use deep heat balms and creams with the therapy clothing? No, you should not apply any balms, oils, heat rubs or other moisture products under far infrared reflecting clothing items.